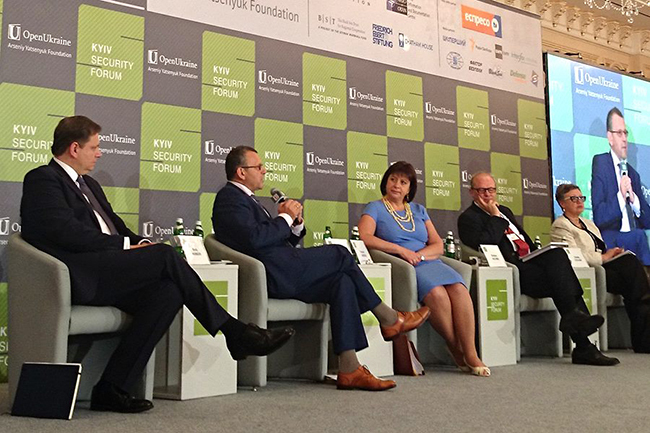 Kálmán Mizsei, Head of Mission ‪EUAM‬ today spoke at the 8th Kiev Security Forum in a panel devoted to Western support for security sector reforms ‪SSR‬ in Ukraine. Alongside Ukrainian Minister of Finance, Natalie Ann Jaresko, he made a strong case for deep and comprehensive reforms of the Ukrainian security sector. “What is needed to combat corruption in the judiciary and the police is to raise the salary. If people get 100 dollars a month, they will continue to fuel corruption. The European delegation is now working hard with the Ukrainian government to support reforms. And Ill be frank with you: civil service reform should be accelerated, it is extremely important, especially in the strategic sectors” — said Mizsei. The EU delivers advice on SSR and supports the development strong, reliable and responsive structures to maintain European standard security structures in Ukraine. The Kiev Forum on Security has been contributing with high profile knowledge and debate on current vital security issues in the Black Sea region and wider Europe since 2007. The debates at the forum focus on regional conflicts resolution, reforming law enforcement and the judiciary, migration, organised crime, border management, corruption, terrorism, human trafficking, etc. Other speakers on the panel were: Andres Aslund, Senior Fellow, Atlantic Council, Andy Hunder, President, American Chamber of Commerce in Ukraine and Zaneta Ozolina, Professor in the Department of Political Science, University of Latvia.